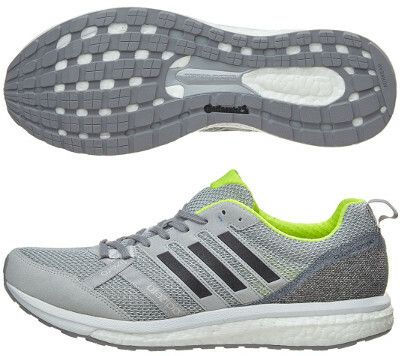 Adidas Adizero Tempo 9 are stability performance running shoes. The Adidas Adizero Tempo 9 adapts latest Boost™ development in a performance running shoe with pronation support. Also noticeable is the removal of the "Boost" hype word from official name as flagship foam becomes standard among running shoes from the well-known german brand. The Tempo 9 is a great choice for tempo runs (what a surprise!) and speed workouts, a more than competitive alternative for popular Asics Gel DS Trainer 22 when racing half or full marathon. Launch of official predecessor Adizero Tempo 8 did not get much attention from media because Adidas did not promote lack of changes from earlier Adizero Tempo Boost (aka Tempo Boost 7). Upper in current edition is simpler with more open mesh to enhance breathability and brings in an original solution with crossed straps at the beginning of toe box (Adizero Webbing, inspired by Origami) for improved fit without chafing. Major highlight in Adizero Tempo 9 takes place in midsole getting rid of "Stable Frame" and playing around with Boost™ density in what Adidas calls "Energized Stability" in a similar way its bigger sibling Supernova ST does for progressive pronation support while firmer EVA layer on top features a more responsive ride. Outsole has larger Torsion® unit contributing to natural integrity in the midfoot for good stability decoupling forefoot from rearfoot and embraces "StretchWeb" configuration which reminds its counterpart for neutral runners Adizero Boston 6 with more durable AdiWear™ rubber in more exposed areas and Continental™ one in others to improve grip.